I have been caught up in the day to day that summertime brings here at the farm. So much so that I see I haven’t posted since the middle of May. I don’t want to just sum up, so let me elaborate. After losing both Connie and Loretta, and since I wanted to hold off breeding Rosie for at least a year, she was getting rather belligerent. 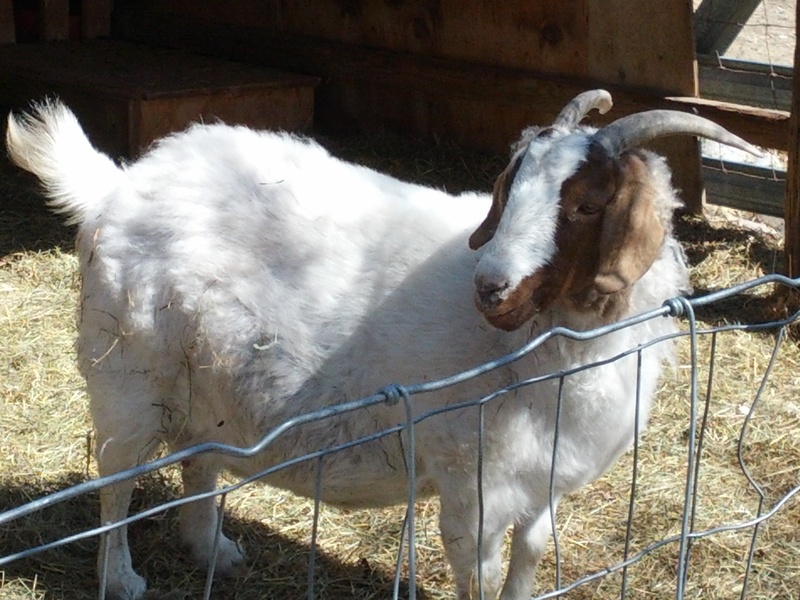 I could not have her in the pen with new baby goats so I advertised her on craigslist. 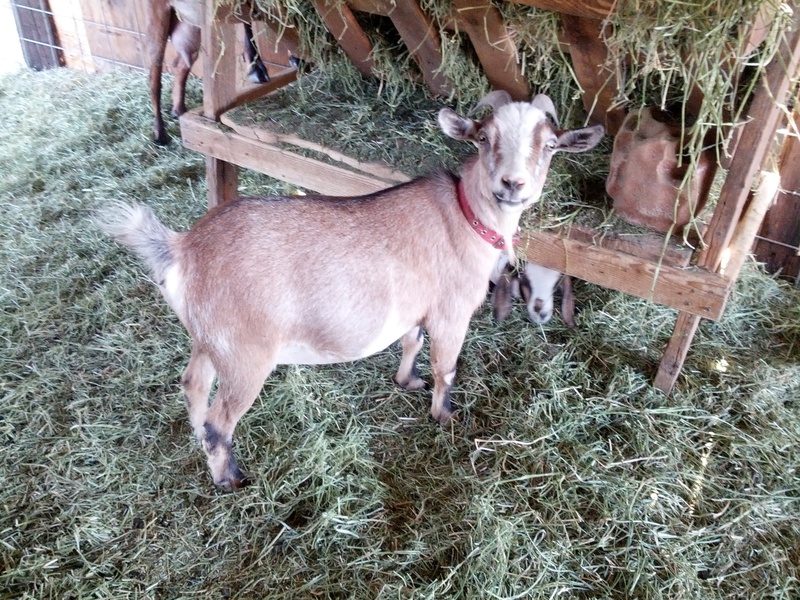 Aside from the folks wanting to buy her to eat, I got a call from a goat farm down by Preston wanting to look at her. Unlike other potential buyers, these folks actually kept the appointment to look at her and after some negotiation, She went off to a new home. The people she went to breed Kiko X Boer meat goats and they were willing to give Rosie another chance to be a mama again. They claimed that Kiko babies are smaller to start with and gained rapidly after birth. Rosie always had trouble with the bigger babies from the Nubian bucks. I hope she does well in her new place. Never heard back from the (s)crap guy. I wrote last that he had come by with some parts and took some measurements. Well that useless waste of human skin never came back. 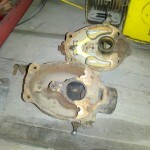 No parts, no money… I’m trying to look at this as a valuable (or expensive) lesson in trusting people. Every time I think about it it makes me very angry, so I’m not over it yet. I had a real mechanic out to look at the tractor. After losing money to a scam artist, I carefully searched the area for a reliable mechanic and found one with a good BBB rating. I talked to him over the phone and he warned me that his primary business was yard maintenance, but he would come by and look at the tractor and other vehicles and tell me if they were worth messing with. I had him back the next week and he worked on the tractor for about 2 hours and came to the conclusion that the float in the carburetor was sticking and a simple rebuild would do the trick. I thought that if that is all that is needed I could do it myself. I paid him for his time and then ordered a rebuild kit online. 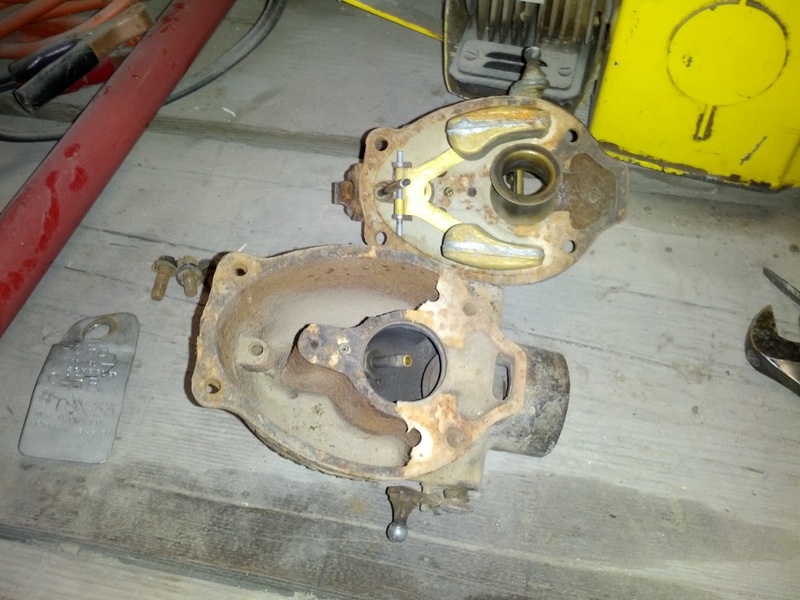 The kit came in the mail about 5 days later and I actually took the carburetor off of the tractor, disassembled it and put the parts in a can of cleaner. That is where it still sits at this point. It does not seem to be that difficult of a project, I just got sidetracked, it seems to happen rather easily. I will get it finished. I will probably need the scraper for this winter. Hay delivery , barn painting and garden planting. Then Jenni came home. The weather was warming up and it was time to get the garden planted. I rototilled both plots twice to try and stay ahead of the weeds. We planted over the next week or so, but by now it was end of May. Kind of late to have much mature in this short season area. Meanwhile I was running out of hay for the goats. At the same time the plumbing (drains) in the basement under the kitchen and specifically the lines for the kitchen sink and the washer plugged off. I tried snaking them out, but the old pipes had some fairly tight u-bends that the snake would not go through. I tried taking the drain run apart to get at the clog from another angle, but like all plumbing projects I take on, the next thing downstream broke. I opted to call a plumber. The guy we finally hired replaced not only the washer drain line, and the piping mess under the kitchen sink, but part of the main sewer line that goes to the septic. The old cast iron was getting thin and I chose not to have him come back under emergency conditions. Part of the replacement that we talked about was venting for the drains. the only original vent stack in the house is for the bathroom and it does not work at all for the second lav or the kitchen and forget about the washer. The plumber installed short vent fittings called “Studor Vents”. I’m sure it is a brand name, but it is for retro-fitting old plumbing like mine. It is a one way air vent that puts air behind the drain line and it has, oddly enough, improved the functioning of the R.O. filter system. I know why, but I did not expect that bonus. 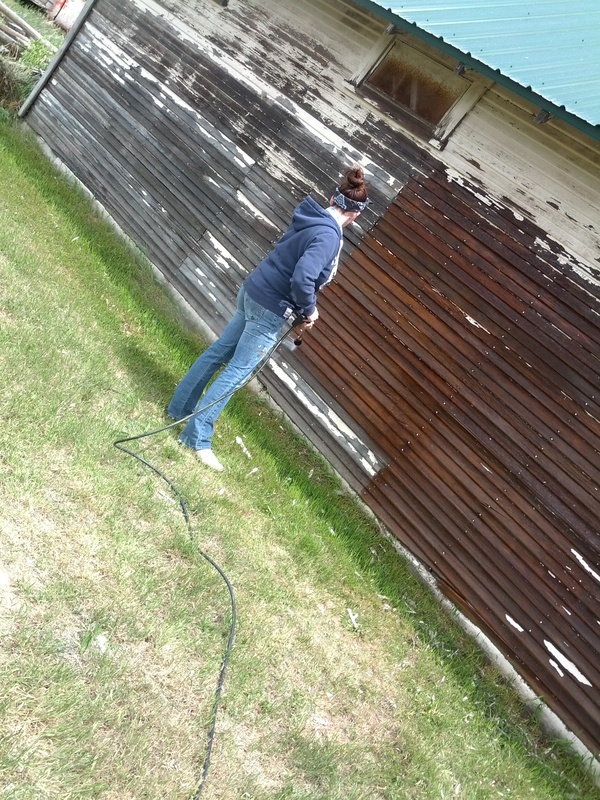 One of Jenni’s projects while she was home was to paint the barn/shop. At first it was way too cold to be playing in the water, and then it got warmer and then she had to go back to the ship. 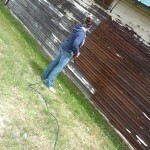 My wife and I did the painting and I had Alex and Carley work on the trim. Then the hot weather really kicked in and the work stopped until it gets cooler. hopefully that will be a gradual thing and we won’t go right from 90 degree days to snow. We did actually manage to powerwash the west side and south end of the building, but the power washer has a physical limit on the length of hose that it can draw from, so I will have to scrub down the other two sides. wanting to paint in cooler weather means clearing the ground in this hot weather and I have managed to do that, but what do I do with all of this JUNK? Back to the hay problem. Hay has been going up, up, up in price in the three years I have had to buy it. I had three bales left and none of them were very good. It was grass hay I had bought in the fall and some of it had gotten wet and started to mold. It got wet because I had bought a cheap tarp at HF that did not last. Cost of cheap tarp + cost of hay the goats won’t eat = expensive. I wanted to find good hay at a reasonable price, but I could not find the guy I had bought it from the previous spring. His cell number had changed and his land line was disconnected. I saw an ad on craigslist and called the number. It was a farmer in Twin Falls and he had 3rd cutting alfalfa/grass from 2012. He heard my sad tale and said he would sell me his “imperfect” bales for 175/ton delivered. I ordered 5 tons, could he deliver on that following Saturday? He could be here the next day! Then he kept having equipment failures. A trailer would break down….. They finally delivered 5 tons of hay on Saturday like we had first agreed. He gave me better bales than he had promised, AND at a better price than we had agreed to! I just ordered 7 more tons to get my goats through the winter. I found an orphan goat and brought her home. 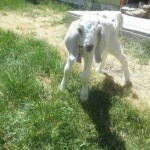 Since I only had one female goat kid this year, I had been looking on craigslist for a new herd member. 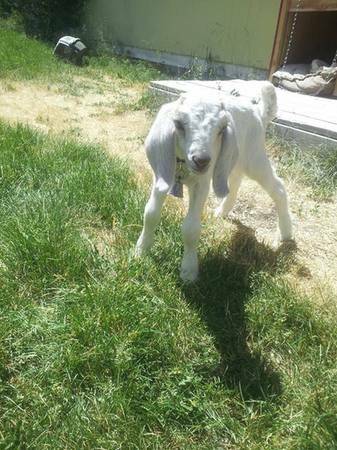 My neighbor sent me a text with a screen capture of a craigslist ad and the message “you should get this goat”. So I called the number and left a message and called again. I finally got through to the person posting the ad, and she told me she had found goat milk to feed this little orphan. I had not realised she was looking for a goat mama OR milk to feed the baby and NOT to get rid of her. 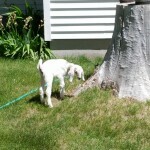 About a week later the same little orphan goat was back on craigslist looking for a new home. Her owner was moving and could not take her along. I called, left a message, called again and finally got in touch with the person posting the ad. I met her in the parking lot of the church she attended along with her son and the goat. I paid $35 for the goat and she rode home with us in the truck on Marky’s lap. Her name is Phoebe and they had her trained to follow them around just like a puppy. They even had a collar with a bell on it so they knew just where she was. I have been making sure she becomes part of my herd, so while I have to bottle feed, I don’t let her just wander around with me. She has established herself with the herd and can hold her own with her herd sister Domino. She is also now starting to eat hay and grains and weeds and leaves and small crab apples when she can steal them from the bigger girls. This is the schedule and rhythm of summer. Monday is mowing day, I just have too many other things to do on the weekend and mowing the acreage just seems more like a monday kind of task. On Wednesdays I water. More specifically I flood irrigate the lawn and the orchard. I have sprinklers set for most of the week to keep the garden watered and other places that the flood irrigation does not reach. Since I am putting down so much water in the garden areas the weeding is also a constant task that is slowly outpacing me and my summer energy. 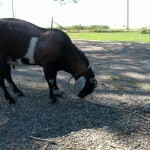 The other part of watering is keeping the goats supplied with all they need in this heat. The ducks puddle is also in need of constant refilling and I have to completely empty and refill it every two to three days. The last part is feeding, which kind of includes milking , which I will get to in a minute. I bottle feed Phoebe every 4 hours. Thats 8,12,4,8 and a little at 10 just to get her through the night. 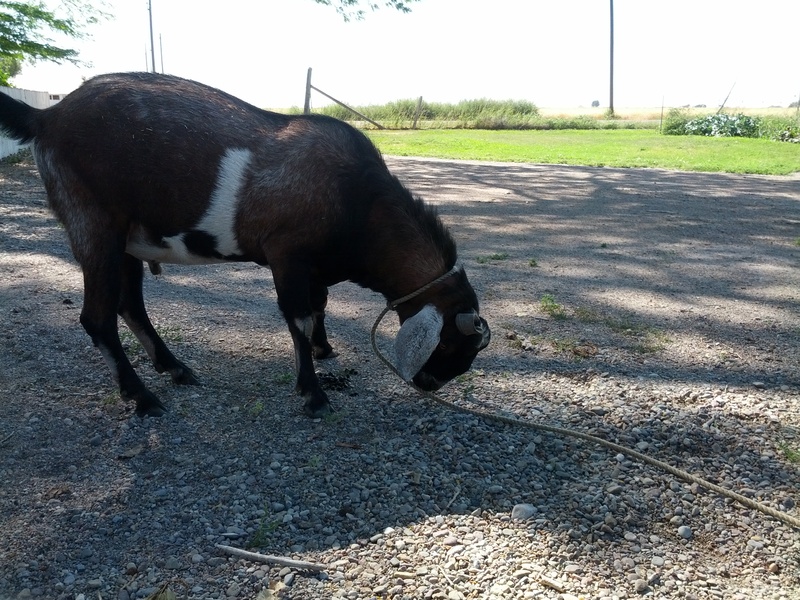 I also give the big goats some grains at 8 am and 8 pm and of course hay whenever they empty their feeder. I am now also cooking the meals when both of us are home so I will include that in the feeding. Add to this the dog who likes to play ball and go for walks, and since Marky is working I do some of her “cat herding” as well. There are times when I cannot do some scheduled task, like this week. I did not get to the mowing today this will throw me off schedule a bit and nothing feels right until I catch everything up. This year we had a rather subdued July 4th celebration with many who would normally be in attendance deciding not to travel. I did have my brother and his wife and our grand niece here for a few days, also my niece and her husband and son from Marky’s family came out for barbecue and to watch the fireworks. My neighbor Alex decided to show the kids how much fun it is to chase the ducks (it is rather comical when they run) and then have them chase you when you turn your back on them. I did warn them not to chase the ducks too much, explained things in oh so grownup terms about the ducks not liking the game they were playing. When the drakes had enough of the chase game they made it quite clear to the kids they had had enough! one minute the kids were laughing and chasing and the next they were being pursued through the orchard by beady eyed, feathered bundles of malice which were nipping at their little butts. I have never seen such looks of terror as were on the faces of those kids. I have also never tried so hard NOT to laugh. If you have seen pictures of the running of the bulls in Spain, imagine it with ducks, puffed up as big as they can get, wings flapping, beaks open, hissing and the kids trying to get out of the way of these web footed harbingers of death. The web footed harbingers of death are watching you! The new chickens are giving me about six eggs/day now. they started out pullet eggs and a few double yolked ones and even two or three double yolked pullet eggs, but they are settling in to a good size and people are starting to buy them again. The Ducks are also starting to lay. It’s different than with the chickens, I mean I get pullet sized eggs and large double yolked ones, but the ducks lay their eggs in the morning and that’s it for the day. I have to check the chicken’s nest boxes several times each day or they start eating the eggs. 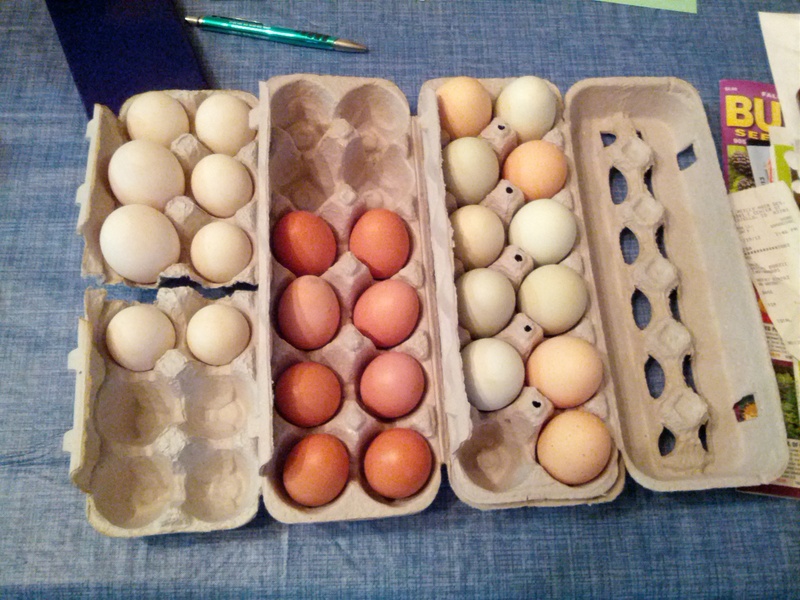 The local CO-OP sells duck eggs for $6 and some change/dozen. 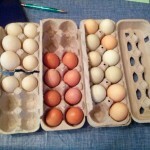 I don’t know if there is enough of a market for duck eggs, at 5.50 to 6.00/dozen but we will see. 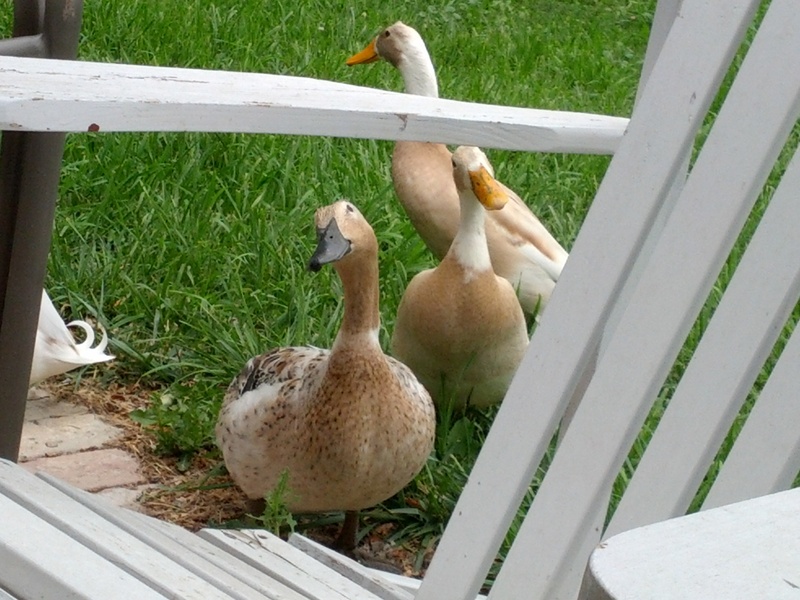 besides, it takes at least 6 days to get a dozen duck eggs since I only have 2 layers and I have observed some mating behavior in the duck flock, so maybe I will have more ducks instead of just eggs? It’s a possibility. 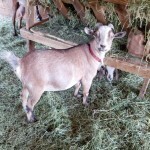 (the boys are gone) For the past three years I have had more boy goats than girl goats born here at StoneFace Farm. That first year connie gave me Waylon and Willie and Rosie had Oreo, June Carter, and another girl that died the third day. Waylon and Willie went to Seattle to help celebrate ramadan, I still have JuneCarter who is now my herd queen and Oreo who keeps the bucks company. Last year Rosie had Big and Rich, and a big boy who was delivered dead and caused her massive tearing and subsequent infection. Connie had Brooks and Dunn, and JuneCarter had Dolly and Kenny. Loretta, whom I bought from down the road had a single girl, SkeeterD. This year I lost Connie and then Loretta before they had a chance to kid. JuneCarter took over as herd queen and gave birth to Frost and OddJob, Loretta gave birth to Drax, and Dolly gave birth to Domino and Midnight. The point is, to get back to the milking, when those goats get to the two and a half to three month age they are consuming a large amount of milk and then when they are wethered and sold off, I suddenly have this large amount of milk to deal with. I had to go right to milking twice each day. So far I am getting just under two gallons per day and that is because Dolly is still nursing one kid. When she weans Domino I expect that will increase. 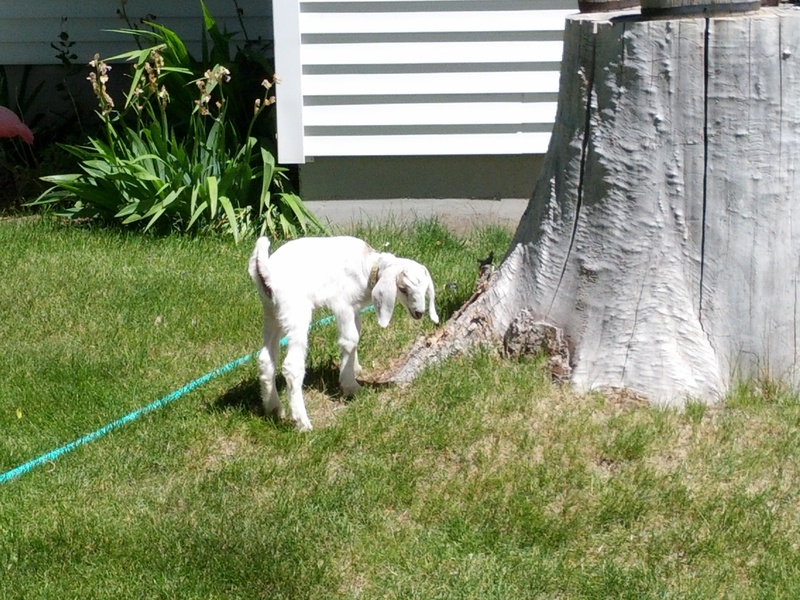 Last year after talking to one of the ladies in the church I discovered that the goats would adapt to once per day and they did fine. I will most likely do that again. Last year I set milking time to mid afternoon so that the weather would be as warm as possible. This year I may try mid morning to see if it makes any difference in the quantity of milk. I have also been encouraged to certify to sell raw milk in the state of Idaho. Since I see prices for raw goat milk up around $8/half gallon, I think that may be a worthwhile effort. I do believe Abby is preggers! So, Last year I bought a Nigerian Dwarf buck from the local pet store. Yes, OUR local pet store sells goats. I have had Rascal and Abby together since February or March hoping for some cute little ND babies. My last prediction for birth was end of August, based on my observations at the time. I believe I commented that I thought Rascal had finally figured out which end was which. Well I had kind of lost track and then all of a sudden noticed that Abby now has that distinctive bulging pregnant goat shape and is developing an udder! I have moved her in with the other girls so she had a safe place to birth her babies. Rascal being the belligerent butthead he is, still does not like being alone in his pen. He does have the ducks right there, but doesn’t care for their company and head butts the fence whenever they waddle past. 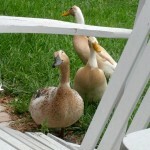 In his defence, the ducks do tend to talk a lot and Rascal is the more quiet contemplative type. I am working on clearing a space for him over by the Buck pen so he at least has THOSE buttheads to keep him company. Also that pen was constructed for the chickens and was never intended to hold goats. He is slowly tearing the fence apart. I have had Buck-O on craigslist for months now and since it is getting towards fall breeding season, I finally had a response to that ad. A couple from Georgetown Id. came out on Saturday to look at him. This is the first time I have seen someone actually climb in the pen with this smelly bunch of bucks and try to catch him. Then when we had him caught This guy did a through hands on examination just like any old farmer/rancher looking to see if this was the stock he was looking for. Sam told me he liked the Buck, but thought he was over priced (at $200) but he would think on it and call back on Monday(yesterday). I did get a call and he asked if I would take $175. I was actually willing to drop the price to $150, but acted reluctant and finally agreed to his offer. Sam and his wife came yesterday afternoon to pick up Buck-O and take him to their ranch. 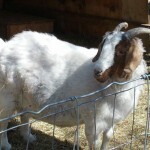 He will be part of their breeding program to raise Boer-Nubian cross meat goats which they evidently sell in California. I wish them success and healthy stock. If I get the urge I may take a trip to Wyoming one of these days and stop by their ranch on the way just to see that operation.